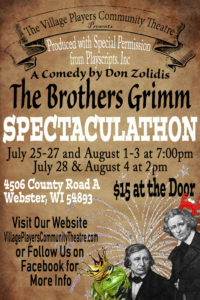 Welcome to Village Players Community Theatre (VPCT) in Northwestern Wisconsin, which provides quality entertainment for the area featuring local talent. The Voyager Village Event Center (aka The Stables), where we stage our productions, is located at 4506 County Road A, Webster WI, approximately halfway between Highway 35 and County Road H.
VPCT and Director Miranda Burger invite you to audition for our next show! Auditions will be in the Webster Middle/High School Choir Room on Sunday, October 14 from 1:00-3:00 PM and Tuesday, October 16 from 6:00-8:00 PM. All are welcome. No prior acting experience required. You do not need to prepare anything in advance. Must have availability the end of July and beginning of August as that's when the show will be. Rehearsals flexible. Flexible Casting Options. The fairy tales of the Brothers Grimm are turned on their heads in this fast-paced, rollicking ride as two narrators and several actors attempt to combine all 209 stories ranging from classics like Snow White, Cinderella, and Hansel and Gretel to more bizarre, obscure stories like The Devil's Grandmother and The Girl Without Hands. This year we are celebrating our 20th anniversary of summer productions. We would be thrilled if you celebrated with us. © 2018 Village Players. All Rights Reserved.